My first encounter with QUINOA was only few years ago. Before that, I never heard of it. My Peruvian friend told me that it has been around for centuries, and I thought of myself, what a goose! When I googled QUINOA, I found out that it is a whole protein and is packed with dietary fiber, iron, magnesium and phosphorus. This grain is gluten-free and has seen an increase in popularity in gluten-free diets. So gifted! -Quinoa and I can sure be pals. And all of a sudden, every restaurant I know has a quinoa recipe on his menu, and every Lebanese recipe has been exposed to the Quinoa factor; Tabouleh with quinoa, Falafel Quinoa, Zucchini stuffed with quinoa, Halloumi quinoa salad and many more. Ever since, I geared up and Quinoa became a staple in my pantry. One of my favorite Quinoa recipes that I’d like to share today, as it’s also going on my Christmas menu this year, is Quinoa and Chickpea Salad. And here how I make it! 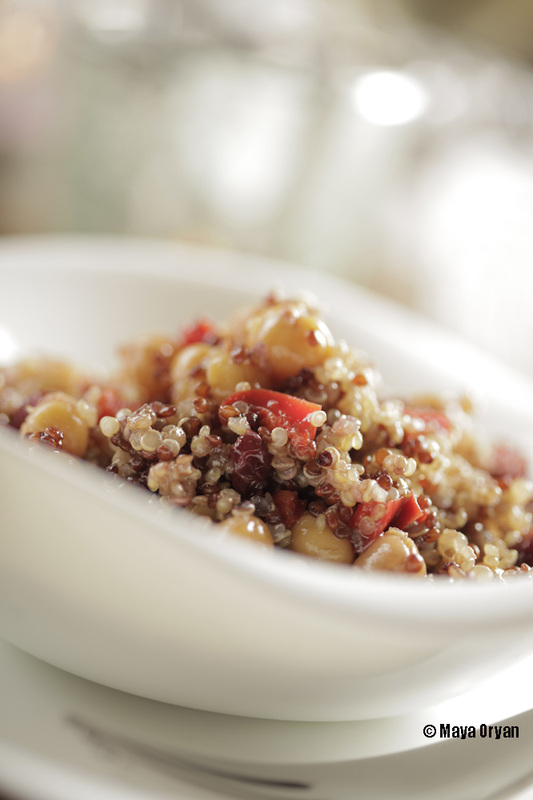 Basically, 1 cup of quinoa is cooked in 2 cups of water. Boil until all water is absorbed. In a salad bowl, mix all 4 ingredients. Whisk together the sauce’s ingredients until thickened and drizzle over the quinoa-chickpeas mix. Combine well and serve. This entry was posted in Recipes, Salads and tagged capsicum, chickpea, Christmas, cranberry, dinner, Food Blogger, food photography, Food Stylist, Lebanese food, Maya Oryan, Mayas Ingredients, Quinoa, Salad, serge oryan, starter by Maya Oryan. Bookmark the permalink. This sounds really good – and how healthy too! Great idea! Thank you. Add to all so easy to make and can be eaten as the main course!